Enhance the diet of woodpeckers in your area using this Woodpecker Blend. This seed mixture was designed to keep woodpeckers happy and healthy, incorporating some of their favorite foods. 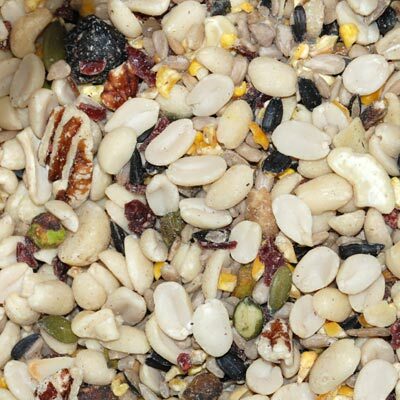 Peanuts, tree nuts, and sunflower seeds mimic the birds' diet in the wild, and the addition of raisins to the mix evokes berries and fruit commonly enjoyed. Shelled pumpkin seeds and corn lend additional flavor, and offer birds the nutrition they need year round. Help woodpeckers thrive by offering this Woodpecker Blend. Note: This Wild Bird Seed Mix, Woodpecker Blend, is packaged in a 50 pound bag.